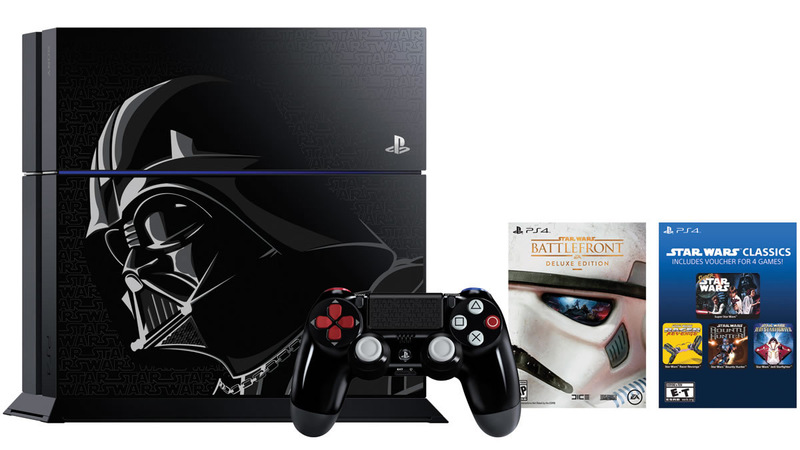 Sony Computer Entertainment will release two Star Wars Darth Vader-inspired PlayStation 4 limited edition bundles on November 17. You can pick up Star Wars Battlefront Deluxe Edition or Disney Infinity 3.0 Star Wars Edition. The Star Wars Battlefront Deluxe Edition bundle includes a custom 500 gigabyte limited edition PlayStation 4 console and DualShock 4 controller inspired by Darth Vader. 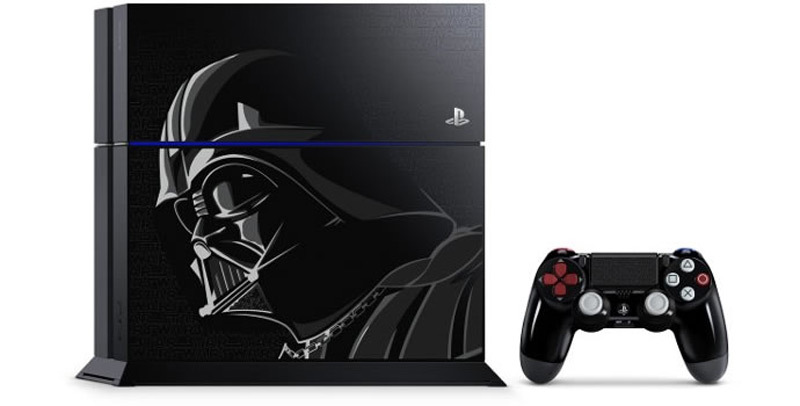 The hardware features an image of Darth Vader, as well as repeated Star Wars logo across the top of the system. The same repeated logos are featured on the touchpad of the DualShock 4 controller. The bundle also includes a digital voucher to download four classic Star Wars titles – Super Star Wars, Star Wars: Racer Revenge, Star Wars: Jedi Starfighter and Star Wars Bounty Hunter – playable for the first time on PS4, and sporting enhanced graphics and Trophy support. To celebrate the launch of Disney Infinity 3.0 Edition, Sony is releasing a Limited Edition Disney Infinity 3.0: Star Wars PS4 Bundle, that will be available exclusively at Wal-mart on November 17th in North America (not in Europe). It includes everything included with the Star Wars Battlefront bundle, but replaces Battlefront for Disney Infinity 3.0 Deluxe Edition, as well as the “Rise Against the Empire Play Set Pack” and PlayStation-exclusive (throughout the holiday) Bobba Fett figure. It will also include a digital voucher for the four classic Star Wars games mentioned above. In addition to these two limited edition bundles, Sony will also release a standard edition Star Wars Battlefront PlayStation 4 bundle including the standard PlayStation 4, a copy of Star Wars Battlefront, and the four classic Star Wars games.